The Executive Officer of our organisation, Rose Marie Vojakovic, sought information from Professor Anna Nowak as to the progress of clinical trials. Professor Nowak replied to Rose Marie as follows: “Clinical trials at our centre have recently gone a little too quiet for my liking. We have recently completed enrolling all patients to the FRAME study, which was testing a tablet anti-cancer agent called AZD4547 in people who had previously had standard chemotherapy for mesothelioma. With the study complete, our current focus is on quickly analysing the results in time to report them at the upcoming Clinical Oncology Society of Australia (COSA) annual scientific meeting, a national oncology conference which is being held in Perth in November. 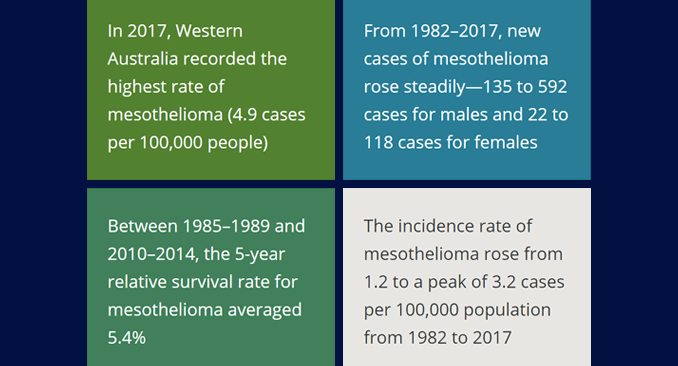 Speaking of the COSA conference, one of the two cancer types being focussed on this year is mesothelioma. We will be fortunate to have two fantastic international visitors, mesothelioma surgeon Mr John Edwards, and medical oncologist/clinician scientist Professor Dean Fennell, both from the UK, as speakers at COSA and also visitors to NCARD. Both are long-standing friends and colleagues of our team, so it will be wonderful to host them in WA. Professor Ken Takahashi from Sydney will also be visiting to speak on asbestos and mesothelioma, and Dr Sonja Klebe from South Australia, an international expert on mesothelioma pathology, will be taking part in a ‘debate’ on diagnosing mesothelioma with our own Dr Mandy Segal, also a world expert on mesothelioma pathology. Drs Klebe and Segal are always ‘behind the scenes’; pathologists are incredibly important people for our clinical trials, confirming that the diagnosis is correct and providing samples for laboratory testing. In other clinical trial news, we are working hard on two follow-ons from the DREAM clinical trial, our study of combination chemo-immunotherapy. Firstly, because the results have been exciting, we are working with national and international groups with the goal of starting a larger confirmatory clinical trial, known as ‘DREAM3R’. Because around 600 people with mesothelioma would need to participate in this trial, the costs are not small and the logistics are not simple. However, we are making progress, and we would announce confirmed funding and plans if we succeed in making this happen. Secondly, we continue to apply for funding opportunities to complete the important laboratory work on samples patients on the DREAM study have donated for further research. With success rates around 15- 20% for most schemes, we are still awaiting our outcomes for 2018 applications. Finally, even though we don’t have any open trials specifically for mesothelioma at this time, we do hope to have one open for people with ‘sarcomatoid’ type mesothelioma in the near future. We are also able to arrange for people with mesothelioma who have previously been treated with chemotherapy to be considered for trials at Linear Clinical Research, which is on-site at SCGH and often has suitable studies. In the meantime, our laboratory work continues to underpin and focus our next generation of ideas; we continue to work hard on the next breakthrough.” Dear members and friends, as you will observe our researchers are indeed excelling themselves to provide excellent service to unfortunate members and friends suffering from mesothelioma and other asbestos diseases.